Determine your level of preparedness for your credentialing exam…with certainty. Designed to provide an efficient way of preparing for the ARDMS Sonography Principles and Instrumentation (SPI) credentialing exam and/or the physics portion of the CCI Registered Vascular Specialist (RVS) and Registered Cardiac Sonographer (RCS) credentialing exams. This ExamSim program delivers a customized study plan so you can optimize your study time. 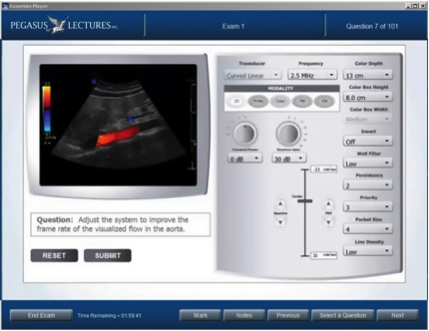 The Ultrasound Physics ExamSim utilizes a patented Intelligent Analysis algorithm to determine the participant’s level of preparedness for their credentialing exam. Information is captured with each keystroke during the practice exams allowing the participant to review their specific test-taking habits (i.e. 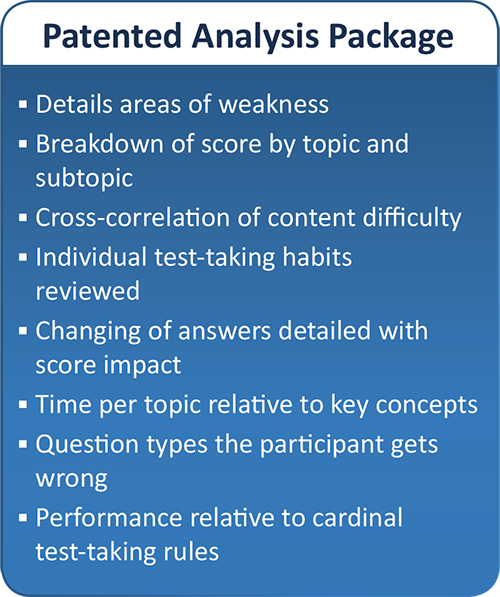 how they are changing answers, what their score would have been if they had not changed answers, time per topic, question types they get wrong and how they performed relative to cardinal test-taking rules.) The comprehensive review section provides thorough explanations to ensure that the participant fully understands the rationale of the question. A full, interactive test-taking tutorial is also included and is designed to improve the user’s overall test-taking skills. Each exam can be taken up to eight times in test mode with unlimited access to all exams in review mode. Anxious about the new Semi-Interactive Console (SIC) questions on the ARDMS® Sonography Principles and Instrumentation (SPI) registry exam? Take the mystery out of this new item types with the Pegasus Lectures' Ultrasound Physics/SPI ExamSim Program. In addition to the patented technology which identifies your level of preparedness for your registry, we have now included questions in the SIC format. Explanations include an interactive console so participants can build confidence by better understanding how to best approach SIC questions. By using this ExamSim program to prepare for your credentialing exam, you will have studied the key concepts, focused on your areas of weakness, and used your study time efficiently. Our new ExamSim programs allow immediate access. You can choose to purchase one, two or the Complete ExamSim ultrasound physics with three, full-length exams. ** This program is designed to operate on computer and laptop platforms (PC and MAC).